It's summer and you're sweating and your hair's all frizzy and all you really want to know is why the weatherman said this morning that today's relative humidity would max out at a perfectly reasonable 52% when it feels more like 77%. Enter the HTU21D-F Temperature + Humidity Sensor - the best way to prove the weatherman wrong! This I2C digital humidity sensor is an accurate and intelligent alternative to the much simpler Humidity and Temperature Sensor - SHT15 Breakout It has a typical accuracy of ±2% with an operating range that's optimized from 5% to 95% RH. Operation outside this range is still possible - just the accuracy might drop a bit. The temperature output has an accuracy of ±1°C from -30~90°C. If you're looking to measure temperature more accurately, we recommend the MCP9808 High Accuracy I2C Temperature Sensor Breakout Board. Such a lovely chip - so we spun up a breakout board that includes the Filtered version (the white bit of plastic which is a PTFE filter to keep the sensor clean), a 3.3V regulator and I2C level shifting circuitry. 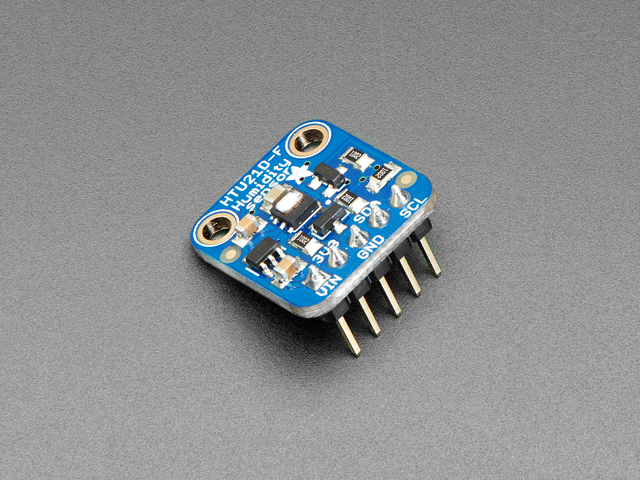 This lets you use it safely with any kind of microcontroller with 3.3V-5V power or logic. Each order comes with one fully assembled and tested PCB breakout and a small piece of header. You'll need to solder the header onto the PCB but it's fairly easy and takes only a few minutes even for a beginner. This guide was first published on Jun 03, 2014. It was last updated on Jun 03, 2014. This page (Overview) was last updated on Apr 24, 2019.